Here are 6 simple but often overlooked biblical principles found in the Bible. We are commanded to live a holy life before God but with the understanding that we’ll never be sinless. We should be sinning less but we understand that we’ll never be perfect this side of the kingdom but is ignorance an excuse? How many biblical principles are often overlooked by most Christians because of their Bible reading habits? It’s so very easy to overlook many of these biblical principles but maybe we should ask why? Perhaps it’s in the way we read the Bible, if we even read it at all. According to many of the latest church or pew research polls, Americans are more biblically illiterate than at any time in history and this includes those who regularly attend worship services. Maybe it’s the way many of us have replaced Bible reading with daily devotionals, which may or may not include Scripture, but human writing can never replace the Word of God as there is power found within. Daily devotionals, as great as they can be, should never replace regular, daily Bible reading. Devotionals can be a great supplement to your Bible reading but not replace it. Most people believe the Great Commission is to go everywhere and tell them about Jesus Christ but here is actually what Jesus commanded His disciples just before His ascension back to heaven, “Go therefore and make disciples of all nations, baptizing them in the name of the Father and of the Son and of the Holy Spirit, teaching them to observe all that I have commanded you. And behold, I am with you always, to the end of the age” (Matt 28:19-20). The first thing that Jesus commanded them was not to simply preach the gospel but to “make disciples of all nations.” A disciple, just as the name implies, is a student or learner, so Jesus wanted the disciples (and by extension, us) to make students of all nations with the lesson plan consisting of the gospel of Jesus Christ and lesson one is the kingdom message of repentance and belief, just as Jesus announced (Mark 1:15). You make disciples by teaching them to observe everything that Jesus commanded the first disciples. It’s almost like a mentoring process but it goes much deeper than that because we are called to disciple all believers in Christ’s teachings. Maybe you’re hesitant to share the gospel of Jesus Christ but Paul declares boldly, “For I am not ashamed of the gospel, for it is the power of God for salvation to everyone who believes, to the Jew first and also to the Greek” (Rom 1:16). Two things are important in these verses; one is that Paul is not ashamed of the gospel of Jesus Christ and so unashamed that he was willing to be imprisoned, beaten, stoned, whipped, and just about anything else you could suffer and two, the gospel “is the power of God for salvation.” In other words, the gospel has its own power. It doesn’t depend upon human persuasion because God’s Word has effectual power to bring about what He pleased (Isaiah 55:11) so all you have to do is to unleash the power of God’s Word and let the Spirit of God work in them but if you don’t, is it because you’re ashamed of sharing the gospel? Jesus warned that “If anyone is ashamed of me and my words in this adulterous and sinful generation, the Son of Man will be ashamed of them when he comes in his Father’s glory with the holy angels” (Mark 8:38). Remember that God is the One Who saves and adds to the church (Acts 2:47). Correcting our friends for their benefit is not something that we like very much but the Bible tells us “Faithful are the wounds of a friend [but] profuse are the kisses of an enemy” (Prov 27:6). I would rather know the truth, even if it meant being corrected, than to not know the truth and stay in error. I don’t want to be flattered because “Blows that wound cleanse away evil; strokes make clean the innermost parts.” (Prov 20:30). Even though this is true, it is very hard to do because we don’t want to offend our brothers and sisters however Paul clearly tells us that “if anyone is caught in any transgression, you who are spiritual should restore him in a spirit of gentleness. Keep watch on yourself, lest you too be tempted” (Gal 6:1). Notice it is a transgression or besetting sin that someone’s caught in or caught doing. If you see that it’s something that must be corrected on, remember that it should be done “in a spirit of gentleness” and love. There is great wisdom in these scriptures as there is in Proverbs 28:23 which says “Whoever rebukes a man will afterward find more favor than he who flatters with his tongue.” I would rather be corrected than incorrect but this correction should only be where there are serious sins that the believer is living in and sins that the Bible clearly condemns. What do you believe about your own salvation? Was it you who came up with the idea or was it Jesus’ teaching which said “You did not choose me, but I chose you” (John 15:16) and that “No one can come to me unless the Father who sent me draws him” (John 6:44). Jesus said that we didn’t do the choosing; God did. The Spirit convicts us of sin, the Father draws us to Christ, and the Son redeems us. All Three Persons of the God-Head are involved in a person’s salvation. Yes, we must repent and believe (Mark 1:15) but the Bible teaches that God grants repentance (2 Tim 2:25) so our salvation involved the Father, the Son, and the Holy Spirit. If you went up to the average person on the street and ask them what repentance means, you’d probably get a blank look on their face but Jesus’ very first message in His earthly ministry was “The time is fulfilled, and the kingdom of God is at hand; repent and believe in the gospel” (Mark 1:16). Jesus told one group that had just reported a tragedy where several people were killed that “Unless you repent you will likewise perish” (Luke 13:3). Why don’t you hear much about repentance anymore? Because we’re afraid to tell people that they must repent which means to turn away from and forsake their sins and only after that, can they put their trust in Christ. Sadly, some people have never repented and because they got baptized, walked the aisle, filled out a “decision card” or told that all they had to do was to believe, falsely thinking that they are saved without ever having repented. If you only believe in Christ, then all your qualified at this point is to be a demon because even the demons believe and tremble (James 2:19), but that belief doesn’t save them. 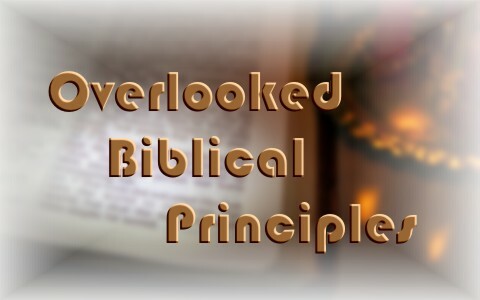 I hope I have opened your eyes to a few things because some obvious Bible truths and principles are not known by many. This could be helped if we stay in the Bible on a daily basis; if you and I understand that we commanded to make disciples; that the gospel doesn’t need our help as it has its own power; that we show our love for our brothers and sisters by speaking the truth to them, even if it hurts; and by making sure people understand that repentance and faith are the two wings that can fly us into the kingdom. Something else to read: What is The Importance of Biblical Doctrine? Next post: What Does The Bible Say About Date Setters That Predict The End Of The World?